Over the last several years, my love of curry has blossomed more and more as I have been exposed to the plurality of flavors of Indian, Thai, and even Singapore curries. My workplace in Japan has a fantastic cafeteria that always has curry, and I often grab me some curry to go with their other often scrumptious dishes. In Japan, curry is a very popular dish, though I am not especially fond of Japanese curries themselves. Nevertheless, Japanese curry packets (pop them in boiling water, then open the packet, empty over rice and add any condiments you like, boom, a meal!) are one of my favorite ways to save time on making dinner. 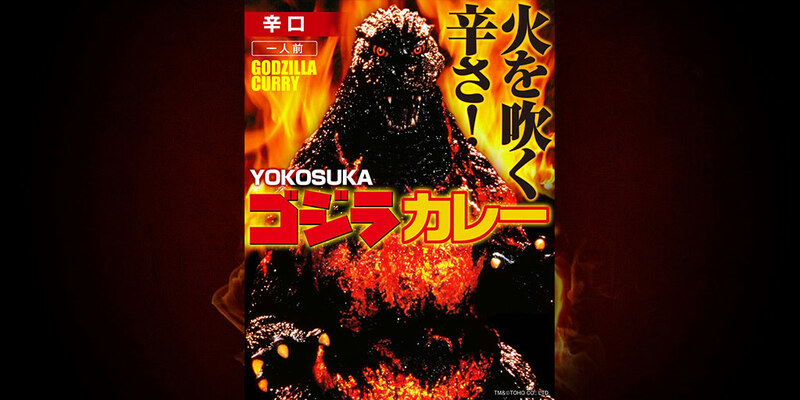 Still, I was not expecting to find that Godzilla had his own curry, the Yokosuka Godzilla Curry (横須賀市 ゴジラカレー) from Dream Planet Japan. This particular curry was apparently made as a sort of souvenir one can buy at the giant Yokosuka Godzilla slide in Kurihama Flower Park, which was installed there because (according to Brian Ashcraft) Godzilla emerged from the sea in that area in the original 1954 Godzilla film. However, the packaging for this Godzilla curry features the Burning Godzilla from Godzilla vs. Destoroyah (1995), probably to underscore that this is one spicy curry. 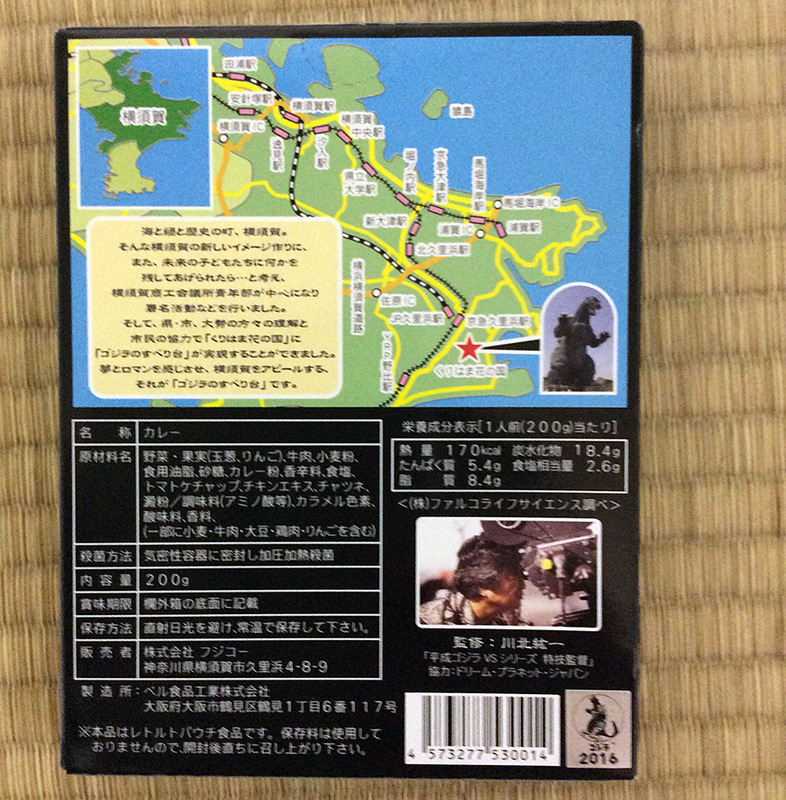 On the back of the packaging is information and a map as to how to get to the giant slide, and a picture of the slide as well. Curiously, Koichi Kawakita is listed as a supervisor for the curry, so this may actually be his recipe! Similar to the packaging of the Godzilla Butamen from the Oyatsu Company, the text on the front of the curry reads “It’s so spicy it can make you spit fire!” (Rough translation.) However, after eating the relatively mild Godzilla Butamen, I couldn’t help but raise an eyebrow. Is this curry actually going to be spicy? In this case, yes, it can. 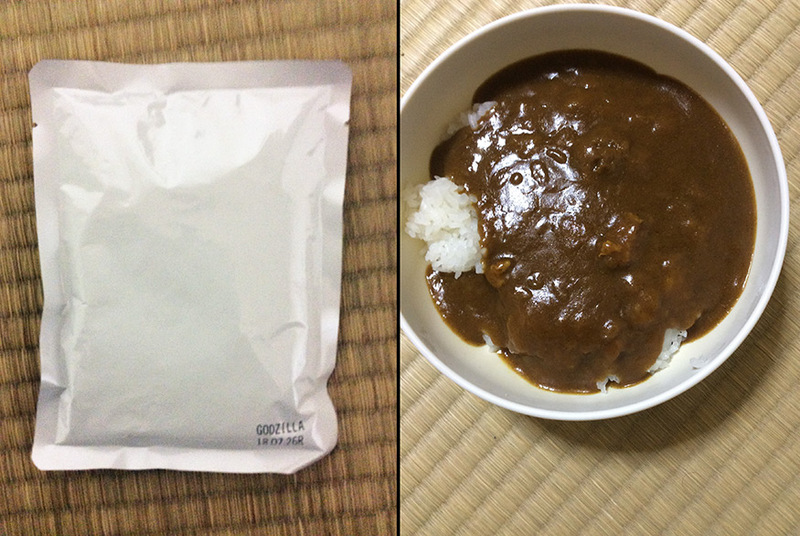 For my taste at least, the Yokosuka Godzilla Curry is quite spicy, enough to make me start hiccuping after just a few bites, and I had to refill my water at least once and add extra rice because this is some spicy stuff! Even after I had finished I munched on something to deal with the spice–which isn’t to say that the spiciness is particularly overwhelming or even painful, but it’s sure enough to make you thirsty! The actual flavor is similar to many Japanese beef curries (this one includes beef and vegetables, and even apples according to the ingredients list! ), but the predominating flavor is the heat. Overall, not a terrible instant curry, but not one I would want to revisit anytime soon. Actually, the Yokosuka Godzilla Curry is one of the best novelty curries I have had in Japan–I picked up quite the collection of novelty curries last year, from Dragon Quest Slime curry to Curry of the Dead to Biohazard Curry, and I was pretty much disappointed all around. Godzilla’s curry is kind of tasty, though nowhere near my favorite curry in the world. Beware: if you are sensitive to spice, you may feel like Godzilla on the cover and get a nasty case of heart burn after eating this one!